Who doesn't love the creamy taste of cake batter dip? This flavor makes your treats delicious and gives a delightful aroma to anything. 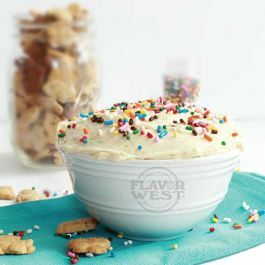 Type: Cake Batter Dip Water Soluble Flavoring. Ingredients: Natural and Artificial Flavoring, Propylene Glycol. USP Kosher Grade Flavoring. Usage Rate: 15-20% for E-use. Flavor suitability: Desserts, pastries and baked treats, yogurt, ice cream, candy and more. Specific Gravity: 1.07 No Refunds on Flavoring. Buy it, its is amazing!1 Authentic and lovely, mixes great with other flavors.. Awesome flavor and very easy to work with. Mixes well with several other flavors in the tool box. Is a great addition to my growing collection of favorites. This is seriously one of my favorites to add for a sweet and creamy background. Love it!